Hodgson Ranch Custom Woodworking is a locally-owned small business residing in Southeastern Minnesota near Lanesboro. Brad Hodgson brought his training and years of experience with Twin Cities cabinetmakers to rural Minnesota where he started his own business on Hodgson Ranch in 1998 with his wife, Leslea. Leslea, who is an artist, brings her expertise in design and color to the woodworking business. More about Hodgson Ranch. Brad has a broad range of experience and has built everything from fine furniture & custom cabinetry to a timber-framed barn. Sustainability is always in the forefront at Hodgson Ranch. Brad and his wife Leslea, use locally sourced woods and materials. Their commitment to sustainability affects the materials and designs they use and the daily decisions that are made at the ranch as a whole. "These decisions impact us personally, and we understand they also affect the environment and the greater community." 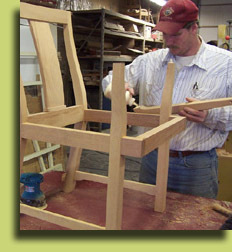 Hodgson Ranch Custom Woodworking builds quality products that they stand behind 100%. "We enjoy creating true craftsmanship that we can take pride in when it goes out the door. This is our mission." This same quality and craftsmanship is also incorporated into any custom repairs and modifications to existing cabinets and furniture. Customers can attest to Brad's craftsmanship and ability to listen to their needs. "Brad built the most beautiful oak mantel for our new home. For a design, we gave him a magazine photo and some additional requirements and he took it from there. When he installed the mantel, it was a perfect fit and the workmanship was excellent. He even matched the woodgrain in adjacent panels. It looks wonderful and we get many compliments. Thanks so much." © 2009 Hodgson Ranch Custom Woodworking. All Rights Reserved.